Artists have long known, whether by intuition or study, how to direct a viewer’s eye through a painting. It’s always interesting, though, when researchers attempt to codify and study these aspects of vision and perception in scientific experiment. Researchers at the University of British Columbia’s Vision Lab recently turned their attention to Rembrandt’s incisive and justly famous portrait paintings in an attempt to identify the source of their visual power and appeal, and in the process, the techniques by which he commands your eye and directs it where he will. It may not come as a surprise to artists who study such techniques that Rembrandt uses value contrasts, “lost and found edges”, and contrasting areas of texture to add interest, and grab and lead the eye; but the UBC researchers found ways to test the efficacy of the techniques by modifying photographs with some of the same characteristics and comparing the response to those and to control photographs without the specified characteristics. You can read an abstract of their article, Rembrandt’s Textural Agency or the press release, UBC Researcher Decodes Rembrandt’s “Magic”, or download a PDF of the entire article, and see the gist of the techniques collected in a poster. For a great resource on Rembrandt, see Jonathan Jansen’s Rembrandt van Rijn: Life and Work. In a link from the article mentioned in my previous post on Master Artists’ Palettes, Lucy Davies pointed to a search on the Bridgeman Art Library for “self portrait palette“. 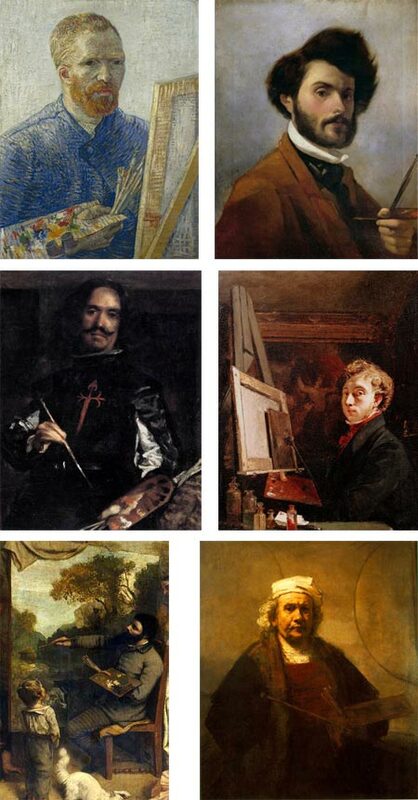 This turns up range of artists’ self-portraits with their palette in hand, a fairly common arrangement given that the artist is usually holding a palette when painting a self portrait. The linked images are on the small side, and unfortunately watermarked, but think of this as a jumping off point. The images are large enough to tell if you’re interested and the listings make it easy to do a broader search for the artist and their works, including the named self-portrait. When looking to match a particular image, you might avail yourself of the specialty search engines that perform similarity based image search (my favorite is TinEye). You can also try the same search on Google Images, though results tend to be more repetitive. You can also search for simply “portrait palette” for a wider range of images not limited to self-portraits, and perhaps more likely to include views of the working part of the palette, often hidden by the angle in the self portraits. There is also an excellent post by James Gurney on Gurney Journey about artists’ Palette Arrangements that is illustrated with portraits. Writing in her blog on the Telegraph in an article titled Why preserve Van Gogh’s palette?, Lucy Davies points to some of the considerations for artists learning from the palettes of the masters, both in choice and arrangement of colors. Those fascinated by the techniques of the great painters would benefit from understanding their palettes. Even when learning from contemporary artists, the palette plays a greater part than is often acknowledged. I always find instructional videos exasperating when they ignore color mixing and act as though the brush is always magically loaded with the the proper color, with little thought or work on the part of the artist. This seems to apply to a great majority of the instructional videos one encounters on the web, though those that are professionally prepared often address color mixing more thoroughly (as in the instructional videos of Richard Schmid). There has, of course, been an effort to preserve the palettes of master artists when possible, even if only as historic artifacts. Davies’ article shows several, including those of Eugene Delacroix (image above, top), Gustave Moreau, Auguste Renoir, Georges Seurat and Edgar Degas (image above, bottom) . If you look around, you can find other photos of famous artists’ palettes, as well as much verbal discussion and listing of the colors used by individual artists, including those of Delacroix, Whistler, Vermeer, Degas and Monet. Often these discussions will make a point of mentioning modern equivalents to fugitive colors used in the originals. In general, the range of colors available to artists has increased over time, with significant additions in the 18th, 19th and 20th centuries as the range of materials increased and artificial pigments became widely explored, importantly reducing reliance on pigments that are not lightfast. Davies also links to selections by art supplier Natural Pigments which sells sets of colors matched to Titian’s Palette and Goya’s Palette. The article is peppered with links and is a nice jumping off point on the subject, including links to discussion of color theory, another aspect of artists’ practice that has changed over time (see my post on the History of the Color Wheel). Alexander Creswell is a well known English watercolorist, carrying on in the traditions of the country in which watercolor first reached acceptance as a major art medium. He is noted for his association with British royalty, painting the Windsor Castle Royal Collection fire and restoration in a book Out of the Ashes and traveling as official artist with the Prince of Wales. The images on his website are found in the sales gallery. He places emphasis on his watercolors and drawings of sailing yachts, showing them first in the gallery. Though these are beautifully done, they are not subjects I find personally compelling. I much prefer his urban landscapes of Venice, Florence and other places in Italy, as well as France, the UK and locations in the Middle East. These owe much to John Singer Sargent’s luminous watercolors of Venice, but of course this is a Good Thing. You can skip ahead to the landscapes by going to page 10 in the numbered navigation at the bottom of the pages. It reverts to sailing subjects again after a while, and picks back up in Italy around 21 and again around 27 (this may change as new images are added to the galleries). You can also see a smaller selection of his urban landscapes on the Portland Gallery site. His watercolors capture that wonderful brilliant sunlight associated with the Mediterranean basin, whether in the intricate buildings of Venice or the rough stones of ancient ruins in Oman, rich with shimmering colors and light-filled compositions. Unfortunately, most of the images on his site are watermarked, though not so egregiously as to make them unsuitable for viewing. Creswell also does large scale banners and hangings of his watercolor images that are used like murals. The gallery for these is accessed through an alternate entry from his site’s home page. Quite often, the best part of an animated short or feature is the backgrounds. Since background images are onscreen for extended periods, and don’t need to change rapidly as do the characters, they are frequently the subject of intense design work and beautiful rendering. For a demonstration of how wonderful animation backgrounds can be when isolated from the movie and empty of characters, visit the Animation Backgrounds blog. Maintained by Rob Richards, this is a treasure trove of stills from animated shorts and full length features that showcase the background artist’s work. There are lots of terrific scenes from animated gems, like the great Warner Brothers classic Hare-Raising Hare (top two images), the beautifully subtle lighting of the Sorcerer’s Apprentice sequence from Disney’s Fantasia (above, third down) and the enchanted forest from Disney’s Sleeping Beauty (4th down, designed by Eyvind Earle). There are also backgrounds from more recent films, like Disney’s Atlantis, The Lost Empire (5th down) and Dreamworks’ The Prince of Egypt (bottom). You can browse through the pages using the “Older Posts” link at the bottom of each page, or jump to individual topics using the links in the right side bar. Either way, there is enough here to classify as a delightful time sink, and Richards seems to be adding posts on a regular basis. François Baranger is a French concept artist, illustrator and comics artist. He has done concept design for both gaming and film, and his film credits include Harry Potter and the Deathly Hallows, parts I and II, and Prince of Persia, though you won’t yet find art from those films in his online portfolio, as they are still under a non-disclosure agreement. You will find art for Arthur and the Invisibles, a new film by Luc Besson, director of The Fifth Element, and Ek-Tor an interesting but cancelled project, also by Besson. There are also galleries of Baranger’s work for other film and game projects, as well as fantasy and junior books illustration, and comics. Baranger uses both digital and traditional media, along with some 3-D rendering. His concept work appears largely like digital painting, in which he maintains a nice feeling of a painterly surface and often utilizes limited, almost monochromatic palettes to great effect. The pieces of his that I enjoy most are concept illustrations for environments, both interior and exterior, in which he can be very evocative of place.